Strange as it may sound there was hardly a perceptible ripple on the sea of difference as between the Republicans and the Democrats, although the names on both tickets were, of course different. But this may be in part accounted for from the fact that one of the principal officers to be voted, namely: Supervisor, was tacitly the choice of both parties inasmuch as John S. Havens the present holder of that office had been renominated by the Democrats, while the Republicans made no nomination whatever for the office of Supervisor. The great contest seemed to be between the Cold Water Brigade, and the Rum and Beer Avengers. The minor offices, and there were quite a number to be filled, and the names of those seeking election to them were made subordinate to this license, or no license movement. The parties on both sides evidently felt like work. 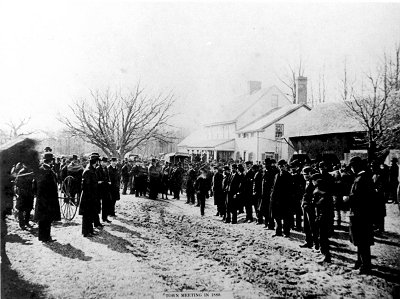 Ellis Smith with several of his Lieutenants was on hand talking to those deluded people, and stuffing tickets into their hands bearing the name of the temperance standard bearer as they filled wagon after wagon with them. Truth was widely departed from in the endeavors of those over zealous men, and we overheard even Commissioner Ellis Smith, in the frenzy of what passes current for zeal make positive misrepresentation as to the amount of money collected through fines during the past two years. Lawyer Smith looked on benignly, and chuckled as he thought of the certain victory of the cold water people's ticket. "Hack" Bishop had steered for Coram with the early dawn and not a prominent rum dealer sought to counteract the "big licks" Ellis Smith and his men were getting in. 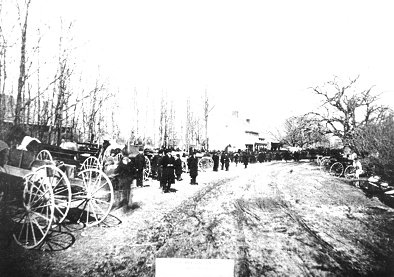 "Charley" Rose drew the best crowd, and as he made known his determined purpose to vote for the nominee of the pro-license men not a little satisfaction was expressed by those in favor of granting licenses, while Brother Ellis Smith, Dominie Harding, and a few lesser lights seemed shocked. As wagon after wagon rolled away to the polls eight miles beyond, the passengers did present a queer sight. The majority of them we had seen gave resemblance to those who attend Camp Meetings, kick up "old harry" after they "had got religion and whiskey too", for a few miserable looking flags were carried in hand and faint cheers were echoed as the country wagon in motion shook them up and down with every motion of its wheel - and all this without any very reasonable cause. The general appearance of the streets throughout the day gave ample prove of the fact that all the voters were out, and that the election was being desperately fought at Coram. Dear Mrs. West. In answer to your inquiry about town meetings. The first town meetings were held is Setauket. I cannot find in the records of the town the exact date when they were changed to Coram, but should think it was about the year 1790. The first place used for town meetings was probably the old Baptist meeting house, which stood where the present Methodist Church stands. In 1792 the trustees provided for an election sermon to be preached by Rev. David Rose at the town meeting to be held there in April of that year. About the year 1800 the town meetings were held at the tavern of Goldsmith Davis, which was the house at present owned by Daniel R. Davis in Coram. It is quite clear that they were held at this house until about 1836, the house passing into possession of Daniel Davis about 1816, and from him to his son Lester H. Davis about 1840. Town meetings were held in 1841 at this house but for six years following they were held at the tavern of Richard W. Smith, which stood on the corner east of the town pump. In 1848 town meeting was again held at the Lester H. Davis house where it was continuously held until 1884, the date of the last town meeting in Brookhaven Town being April of that year. The town elections were subsequently held in election districts. This house was continued as the polling place for this election district which then comprised the entire central part of the Town from Ronkonkoma and Lake Grove on the west to the Ridge section on the east the eastern part of Middle Island. The last election in which the house was the polling place was in the spring of 1886. The election district was divided that year and the polling place was moved to the house of Miss Cynthia Hutchinson at Middle Island, the western section of the old election district being made a new district with its polling place at Lake Grove.